Almost nothing in the Tiki Room is actually enchanted. The Pirates are from Anaheim, not the Carri bean. We’re supposed to believe that the Pooh ride is an “attraction?” Really? Nothing negative is implied by these revelations, of course. All these minor deceptions are designed to enhance the guest experience in one way or another. If they leave you feeling a little uneasy, though, just remember that the Haunted Mansion really is haunted, Toontown is officially a California town, and the Matterhorn is, in fact, 100% matter. 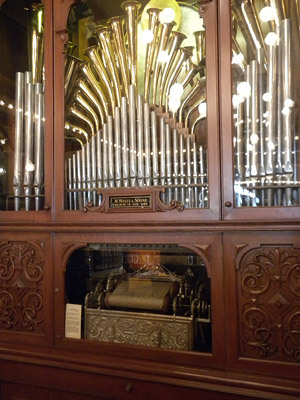 This original 1853 Wurlitzer jukebox sits at the back of the Penny Arcade, completely functional but little used. It is activated by the insertion of a penny and the pressing of buttons “A” and “1” to indicate which of the jukebox’s one available song should be played. The jukebox has all four of its original music rolls available for installation by cast members, for a total of eight songs if the rolls’ “b sides” (which sound quite a bit like the “a sides” with their notes reversed) are counted. 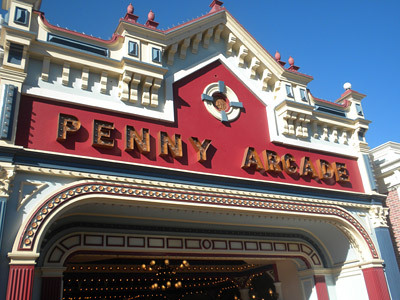 Named for silent movie star Penny Arcade (sister of Crystal Arcade), Main Street’s Penny Arcade was originally home for many coin-operated diversions from days of yore. These included various mutoscopes, “love” and “strength” testers, pinball machines (the kind with real pins), and such classic mechanical amusements as Ping Pong, Pac-Gentleman, Street Brawler, Perilous Combat, Mule Ape, Cannonball Command, Automatron 1984, Pencipede, Turncoat Hunter, Aether Invaders, Luna Lander, Bicycle Newsie, Celebrated Jumping Frogger, Waltz Waltz Revolution, Penultimate Fantasy, Jug Band, Grand Theft Velocipede, and Super Sacco and Vanzetti Brothers. Years later, the adjacent Candy Palace expanded during the middle of the night as part of a hostile takeover action, annexing much of the Penny Arcade’s floor and wall space for the sale of taffy and Goofy Candy Company merchandise. 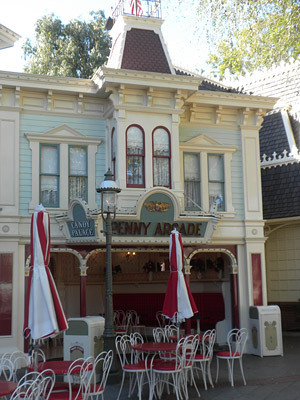 At first, these new items were all sold for a penny to help them better fit with the remaining penny entertainments, but this policy was adjusted when it was made clear that the park was losing millions of dollars a day by selling candy at below cost, and that increasing sales volume was unlikely to solve the problem.